100's of Ideas for Fun in Greater Columbia! Home shopping? 75 New Home Neighborhoods Profiled Here! Restaurants, Breweries, Food and Drink Events! Daytrips, Weekend Trips, Learning New Stuff, More! Three of country music’s shining female stars join forces for the Chicks With Hits tour! Nashville divas Terri Clark, Pam Tillis and Suzy Bogguss perform their guitar-pull style acoustic show and come together to play your favorite hit songs from their legendary careers. Combined, these down home ladies have more awards and nominations than we can count, and all are members of the Grand Ole Opry. Performance will be held on the campus of USC-Lancaster in the Bundy Auditorium. Tickets here. The Lourie Center will hold its 2018 Fall Festival from 9am to 2pm. This annual festival is a fun and informative senior wellness expo featuring local senior service representatives from over 50 organizations, health screenings, flu shots, a free lunch, and an assortment of entertainment and activities. Additional highlights include Guest Appearance by WIS-TV’s Joe Pinner, massage therapy, live music, jewelry sale, raffle, door prizes and much more! Free and open to the public. More here. The annual Congaree Swampfest is back! Featuring BBQ, blues and jazz, and live musical acts like Howard Hewett, Melba Moore, Cherelle, Big Daddy Cade and many more! The whole family will enjoy hay and carnival rides, food/drink and craft vendors, oyster roast, guided tours, art displays, Balloonopolis, and much more. Activities will run throughout the day, offering a great opportunity for visitors to experience the rich culture of the Lower Richland Heritage Corridor. More here. If you've never been to an Old McCaskill's Farm event, go to their Fall Family Farm Day... you'll love it! Treat yourself to a hayride, to picking a pumpkin from the patch, playing games, ride a horse, watch millers and blacksmiths at work... From 10AM to 5PM. Purchase your tickets online and you can bypass the lines getting in! (must purchase by October 4th). There is lots of fun for kids and adults! $5 per person with kids 2 & under Free. Learn more here. The Lexington Medical Center presents Women's Night Out, a yearly awareness and educational event to highlight October as National Breast Cancer Awareness Month. Come hear Ariella Hughes, a two-time breast cancer conqueror, share her personal journey on resiliency and learn how you can bounce back and live beyond better no matter what life sends your way. Held at the Columbia Metropolitan Convention Center. More here. Join Ruth's Chris for their final TasteMaker Dinner of 2018, and celebrate one of America’s most iconic wineries, Stag’s Leap Wine Cellars. As part of this event, guests will enjoy five delectable courses, inspired by the flavors of fall, alongside four incredible Stag’s Leap wines – including two world renowned Cabernet Sauvignons, “Artemis” and “Fay”. 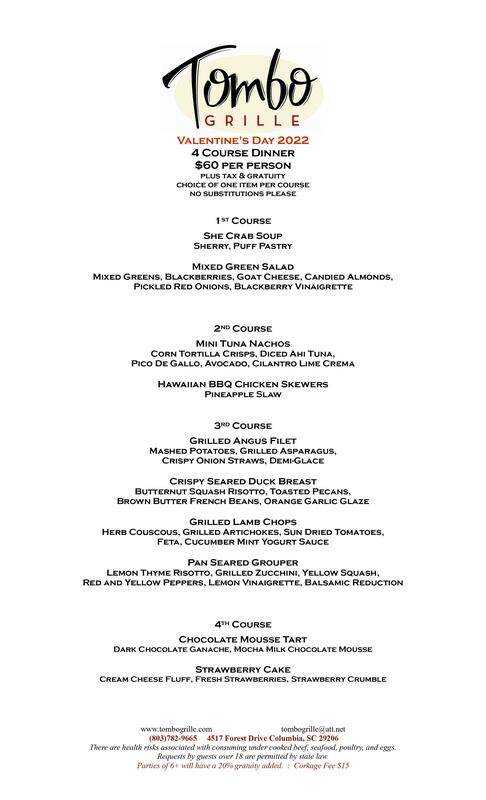 Make your reservations today for what is sure to be a night your taste buds won’t soon forget! More here. Town Theatre opens its centennial season with the classic production West Side Story – one of the most powerful love stories of all time. Beautiful melodies like “Tonight,” “Maria” and “Somewhere” are juxtaposed with fierce and fiery dancing in “America” and The Dance at the Gym. The show runs Sept. 14-30 with 8PM curtains on Thursdays, Fridays and Saturdays and 3PM curtain on Sundays. Don't miss it! Tickets here. It's time to Shake, Shake, Shake...Shake Shake Shake, Shake your booty! The Woody is ready to relive some of the great music from the 70's and see some of our friends from the Diamond Disco. So dress up and tell your friends, because the Diamond Disco Reunion is always a FUNKY good time. Your favorite 70's attire, Best Dressed wins! More here! The Ivy Heritage Foundation of Irmo, Inc., in partnership withAlpha Kappa Alpha Sorority, Inc., Upsilon Omega Omega Chapter is pleased to offer its 7th annual community service event, the "Still Standing Women’s Health Empowerment Luncheon”. Still Standing is an event used to bring awareness to health and societal issues that affect women. This year’s luncheon will focus on Alzheimer’s Disease. The luncheon always concludes with the famous "Shoe Strut" competition. It is always so much fun to celebrate ourselves and others as we walk the runway in shoes that allow us to be "Still Standing" as women. Purchase tickets here. Every last Sunday of the month, make plans to spend the morning with Swamp Cabbage Brewing Company! You'll enjoy a savory five course meal prepared by Chef Jean-Louis and Yvette of The Belgian Waffle Truck. The menu includes spectacular dishes like Cheddar and Bacon Scone, Turkey Sausage Gravy, Shrimp Hushpuppies and Belgian Style “Chicken and Waffle”. Vegetarian options available. Special beer pairing for $10/person. Reservations required by Friday, September 28. Tickets here. The Congaree Vista Guild is hosting Vista After Five, a free concert series in partnership with Tin Roof and The Senate! Shows will be outdoors at Tin Roof and The Senate at 1022 Senate Street. Free admission, and a bar will be available for attendees age 21 and up. Party begins at 5:30pm and bands take the stage at 6! More here. Columbia Mayor Steve Benjamin invites the community to a free, public block party with America’s mayors from 6:30-10pm on the 1600 block of Main Street! Help make mayors from around the country feel at home in Columbia! The block party will feature local food and beverages as well as live music from local artists Reggie Sullivan Band, FatRat Da Czar, Soda City Brass Band and 76 and Sunny. More here. Fall is here, and the CMC Rhythm on the River Concert Series is back! First performer of the season is Going Commando Band. Featured Food Truck is The Haute Dog Lady, and Dessert Truck Drip/Scoopy Doo. More here. Town Theatre Celebrates 100 Years! In addition to being America’s oldest continually operating community theatre, Town Theatre has something else to sing and dance about… it’s turning 100 years old! Formed in 1919 by the Columbia Stage Society, a group of Columbians’ whose ambition was to enjoy live theatre in our city, Town Theatre has always catered to the tastes of its members. The theatre is known for high-quality Broadway-like musicals and, in its 100th season, will present Broadway hits including West Side Story, Newsies and Mamma Mia! Read more here. The Irmo Okra Strut is back for it’s 45th year, with live musical performances, dancing, amusement rides, food and drinks, local artists, exhibitors, Okra Eating Contests and more! Parade will be held around 9am on Saturday, on St. Andrews Rd. After the parade, enjoy dozens of vendors and exhibitors. More here. Check out the latest issue of *DiscoverColumbiaMagazine.com* for a list of upcoming Oktoberfests and September/October beer releases from Swamp Cabbage, Columbia Craft, River Rat and more. The Knight of Honor Gala celebrates the ways police and community work together to create a better future, while benefiting Serve & Connect's mission of building community through partnership. Guests will be transported to a Renaissance village, with medieval-fare, various artisans and entertainers, and medieval-dance lessons! More here. Join the race against child abuse! This is the first annual race to benefit Richland County Court Appointed Special Advocates Foundation. Superheroes for Children 5K will feature a fun-packed day with goodie bags, fair food, dunk tank, games, karaoke, and all your favorite superheroes! More here. Jam Room Music Festival features 12 bands on two stages, downtown on Main St. Lineup includes Baroness, SUSTO, 2 Slices, Kid Trails, Niecy Blues feat. ET Anderson, H3RO, E.Z. Shakes and more! More here. South Carolina Philharmonic starts its season on Saturday with Opening Night: Dazzling Debussy at the Koger Center for the Arts. Featuring the Barber Overture to "The School for Scandal", Gershwin's Concerto in F, Frank Mestizo Waltz from "Three Latin American Sketches", and Debussy's La Mer. Tickets here. Fire Fighters from across the state will be at EdVenture to teach you and your family about the importance of fire safety! Enjoy Firefighter meet and greets, Live Burns, Chili Recipes, Rescue Demos and so much more! More here. The Palmetto Peanut Boil is an annual outdoor festival that draws thousands of attendees from all over the Midlands! In addition to great live music, rides, crafts, and food and drink vendors, the event features over 20 teams vying for the championship trophy! All proceeds from the sale of food and beverages benefit the Animal Mission. More here. For one month, the SC State Museum will become the Museum of Oz! This Saturday, enjoy showings of The Wizard of Oz 4-D Experience™, Skies Over Oz in the Planetarium, meet the characters from the movie, enjoy crafts and games, get a souvenir photo in the Land Of OZ™ and more! More here. The Rosewood Art & Music Festival is a non-profit, one-day, free admittance, outdoor festival where thousands of visitors descend into the Rosewood Neighborhood to enjoy multiple stages of live entertainment, visual arts, poets, music, and more to celebrate southern arts and culture. More here. Come to the SC Confederate Relic Room and Military Museum and learn about World War I air combat and the first air race to Hawaii! Speakers and topics include Joe Long - Balloons and WWI: their value and the men who went up, Fritz - Knight of the Sky: WWI aviation and South Carolinians who flew against Germany’s flying Circuses, and Jason Ryan - Race to Hawaii: The 1927 Dole Air Derby and the Thrilling First flights that Opened the Pacific. More here. Looking for more live music? Check out our September | October Music Calendar from Discover Columbia Magazine here!